I tend to get a bit reflective toward the end of the school year. Somehow, even with the fast pace of trying to fit everything in, my mind starts to think about what I wish I would have made time to do with my students. This year, the answer is that I wish we had read more short stories together. They read a ton of novels for independent reading, read classics and books in verse for book clubs, and we read a lot of poetry together as a class. They read several nonfiction essays, magazine articles, and books, but we did not have a big focus on short stories. I decided to fill this gap and use CommonLit – a website with a great selection of texts with all different themes, grade levels, and genres. I assigned a classic ninth grade short story: The Most Dangerous Game by Richard Connell. I printed and made copies for my ninth grade students, told them to annotate as they read, and gave them a week to read it outside of class, bring it back, and be ready for discussion. I couldn’t have paid her to say something more timely and appropriate. I was already thinking about assigning more short stories, and she convinced me. However, the problem with assigning more short stories was that I had found myself teaching the story rather than the reading skills and habits. I wanted to tell my students about Zaroff’s ideas about what it means to be civilized, and that they should pay attention when Whitney and Rainsford are talking about hunting when they are on the yacht. But upon reflection, I knew that it wasn’t the right way to go. I wanted my students to realized those things because they had the skills to read any story, not because I had told them what to ask or what to think. I asked myself how I could assign classic short stories and resist teaching those stories at the same time. One of my students answered by asking me a question. She said she liked The Most Dangerous Game, but was hoping she would have more choice in the next short story assignment. That was the breakthrough question for me. I realized I could offer choice and expect that my students would read and analyze classic short stories. Because they had already found success with book clubs, this was a pretty natural thing to do, and CommonLit makes it easy. Texts are organized by genre, grade level, lexile, and theme. CommonLit will connect to Google Classroom, which means students can log in with their school gmail accounts. It also means that I can choose which grade level texts I want specific students to read – for a couple of my students, I went one text level band below, and assigned them a selection of stories that would be a bit more accessible to them, but still be challenging and that would provide ample opportunities for thoughtful conversation. My students were told to choose four of nine texts. This meant that many of them read all of the stories before they decided to “really read” the four chosen ones (oh my happy heart!) and their choices were thoughtful and deliberate. They were more excited to read the ones they had chosen with their partners and have returned to class talking to each other about the stories with a greater level of enthusiasm, than when I have simply assigned the same story to every student to read on the same day. I also gave a large chunk of time for the assignment so they could budget their class time and homework time over a couple of weeks, plan to meet with their partners, and make the assignment authentic and thoughtful rather than rushed. I think about how I used to teach any of these stories. The Most Dangerous Game, or The Necklace for example could take up to a week as I would guide them through each word, each sentence, and explain the meaning as we went along. Because my students have been given a wide range of choice over the last year or so, they have become independent readers, and can not only access these classic short stories, but appreciate and enjoy them while they are at it. I’ve loved watching their independence blossom this spring as they tackle harder and harder texts. These are texts they often have very little background information on, but they are learning to find it themselves, use context clues, and talk to each other in their reading communities. CommonLit has been a helpful tool as I have watched their progression. It functions in many ways as an online textbook, but doesn’t feel cumbersome like a textbook can. There is a brief bio/intro with most texts, the lines are marked, and there are footnotes for difficult vocabulary. There are questions to answer as students read, and more thoughtful questions at the end of each selection. What I really like about the questions on CommonLit is the discussion questions at the end of each selection. Students don’t need to write an essay or a formal short answer; instead they prepare for discourse, for literary discussion. We’ve had great success with book clubs (and now story clubs) this year. I’ve loved the conversations I’ve overheard, the more “official” discussions the groups have had, and the individual conferences I’ve had with students. The classroom “talk” has been steadily increasing in quality and stamina, and our summative video discussions should be knock-out. I’ve been so impressed with what giving students choice and voice can do. It feels intuitive after a few months of teaching like this, and not only have students developed strong independent reading lives, but now they are also able to tackle difficult, classic, canonized texts with confidence. One student created this character chart from David Levithan’s The Realm of Possibility as she was reading. She did it not because it was required, but because she likes the book and wants to make sense of it. Author adventuresinhighschoolworkshopPosted on April 23, 2018 July 10, 2018 Categories Book Clubs1 Comment on It’s better with Verse! Short and sweet book clubs encourage readers to try new format. I’ve always loved teaching eleventh grade students. They are fun and funny, curious about the world, and on the verge of adulthood. This is often the year of first cars, first girlfriends and boyfriends, and first after-school jobs. When I used to teach in the States, it was the year when they could finally go off-campus for lunch, the year for college visitations, and the year when they started to really get serious about their futures, saying goodbye to childhood and hello to the grown-up world. I also see it as a key developmental year, when many students really start to read grown-up literature, as they are starting to have the life experience and background knowledge that is needed for so many books. Eleventh grade used to be all about American literature. The focus was more on content than skills, and as we continue to teach with the common core state standards, it’s easier to get away from the traditional canon as we embrace student choice. My students are reading all sorts of titles and authors and genres, which means that the priority has been shifted. Students may be doing more reading than fake-reading (and because of this they may actually be actually reading more American literature than they did in my previous years of teaching). However, we aren’t organizing our units according to topics like romanticism and transcendentalists. We organize by skill, by the type of reading or writing they will be doing in the unit. However, it’s been a little strange to teach eleventh grade English without the heavy focus on American literature, so one of the ways we are trying to reincorporate content is through book clubs. A few months ago my students participated in nonfiction book clubs, and last week they asked me if we could do it again, but with fiction. With classics! Who am I to say no to such a request? So my eleventh grade teaching partner and I gathered titles from our department’s book room and classroom libraries, and came up with some book club options. We had two self-imposed guidelines (not requirements…we are always flexible): books should be written by American authors and have at least a significant portion of the plot taking place in the US, and that there should be a film to go with the book. These are the titles we could come up with in just a few days. I kept my book clubs in groups of two or three students, so that everyone has to participate, and no one can sit back and let others do the thinking for them. To the students who didn’t get their first choice pick, I reminded them that simply because they aren’t reading it for this book club doesn’t mean they can’t read it later in the year. Next is the twist! Students had to be willing to watch the film that goes with the book. We teachers know that students will watch the film. It’s just the nature of teaching high school. While that used to be a problem for me in previous years, I’ve started to relish the idea of students watching the film, and sometimes I surprise myself by telling them to watch it first! 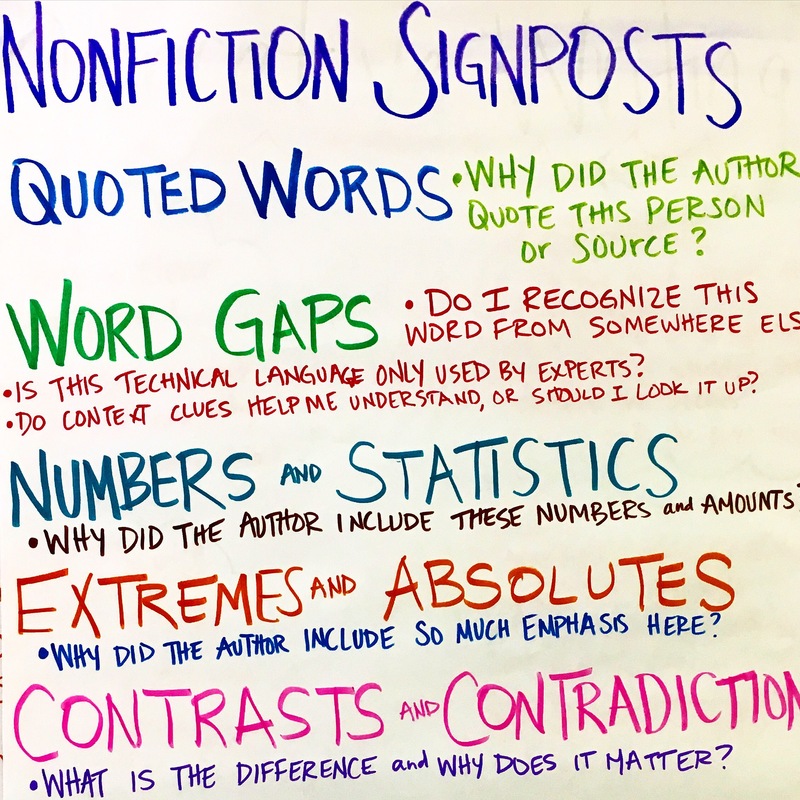 Getting students to read nonfiction can be a challenge, but I believe that it’s important to get kids reading all kinds of texts, challenging or not. So when we started this nonfiction unit, instead of assigning one title or telling students to find their own individual titles, I decided to offer them some choice in what they read, but not total choice. And I did it through book clubs. About a week before the official roll-out, I book talked the titles I had chosen, and asked my students write down the titles that they would be interested in reading. I included a variety of topics and structures, and I think there was something for everyone. Some of the titles offered were Marx for Beginners, Proofiness, In Defense of Food, The Happiness Project, Eyes Wide Open, An Encyclopedia of an Ordinary Life, and Guitar Zero. Putting the book clubs together was a puzzling challenge. I’m not sure what the best way is – it’s all about how many copies of each book are available, and which combination of students prefers which title. It wasn’t easy, and on the day of the roll-out there were some last-minute changes, but it ended up working out. I gave the books out during the next class period and asked students to really dig in and read for a while. This way they were able to build motivation and momentum for their at-home reading. I asked them to individually check their reading rates with their books, and then to set some realistic individual goals around how much they could and should read per week. Then I asked them to take their books home and read some more, coming to the next class ready to at least talk and think a little bit about their new books. During the next class, I still didn’t seat them with their book group members. For their quick write, they brainstormed a list of ideas about what it means to be in a functional book group. What kinds of agreements to group members adhere to? What sort of behaviors do book group members exhibit? Then, at their table groups, which were still not their book groups, I asked them to come to consensus about these points. Each table group had a small white board and dry erase marker, and before they could put any ideas on the white boards, their table group members had to come to consensus that the idea was worth sticking to, and worth writing down. 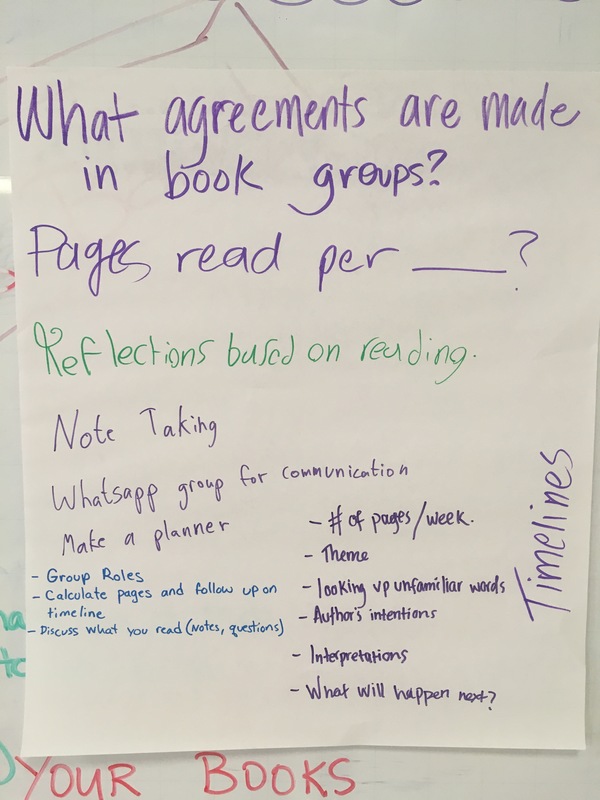 Once each group had a functional list of book group expectations, they could take their lists to the bigger chart that would become our book group norms. Only after they had individually thought about what it means to be in a book club, then discussed it in a small group that wasn’t their actual book club, and then agreed as a class on these ideas, did I let them get into their new book clubs. The reason for this was that I didn’t want anyone to start book clubs without any real thought as to what it means. I also didn’t want to tell my students how to be in a book club because I don’t think it would have “stuck” as well as when they came up with their own norms. And I didn’t want one book club member to start by dominating, or to have any new book club members sitting too quietly. I wanted to offer them as much voice and choice as I could. It’s not a complete list of book club expectations, but it’s a great start and it represents both individual and group thinking. Once the book clubs got together, I asked them to set up their own due dates, expectations, and group norms. I asked them to think about how they want to be held accountable and how to hold each other accountable. As I rotated around the room they did not need redirection or any pushing. They had done the thinking required in order to start off on the right foot. Class ended too soon, as usual. We will finish working on our norms next class, but they all agreed that they knew what they needed to do to get started, and were comfortable with it. Some closing comments from a few of them were about how they liked having a hand in making their own assignments and timelines, and thankfully they even look forward to reading their books. I look forward to hearing their rich talk in the next few weeks, especially since we are starting to use the nonfiction Notice and Note signposts. I wonder how other teachers introduce book clubs, and how much students help in creating the learning situations surrounding book clubs. I’m sure there are other elements I haven’t considered, but I’m looking forward to the coming weeks of student learning with nonfiction. I believe the learning experience will be richer because we started together, not with the teacher tells students what to do model, but rather in a model where students do the real thinking and planning, which creates the buy-in that is essential to learning. I can’t be the only expert in the room, and I want my students to feel empowered to listen to their own and each other’s voices, and to trust that we all have expert opinions, and that we can all learn together.